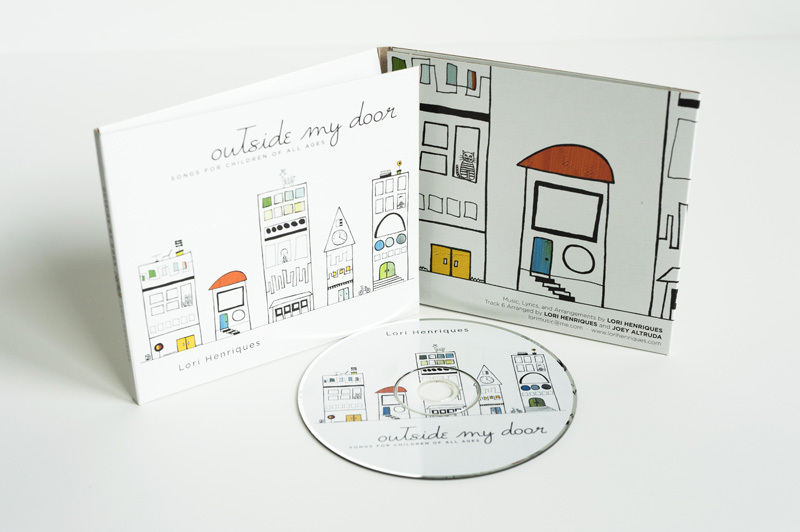 My sister Lori has a new album of original songs entitled “Outside My Door – Songs For Children Of all Ages.” I did the artwork for it, which some of you might recognize since I used the Paper City and added some color and a few extra details relating to her lyrics. 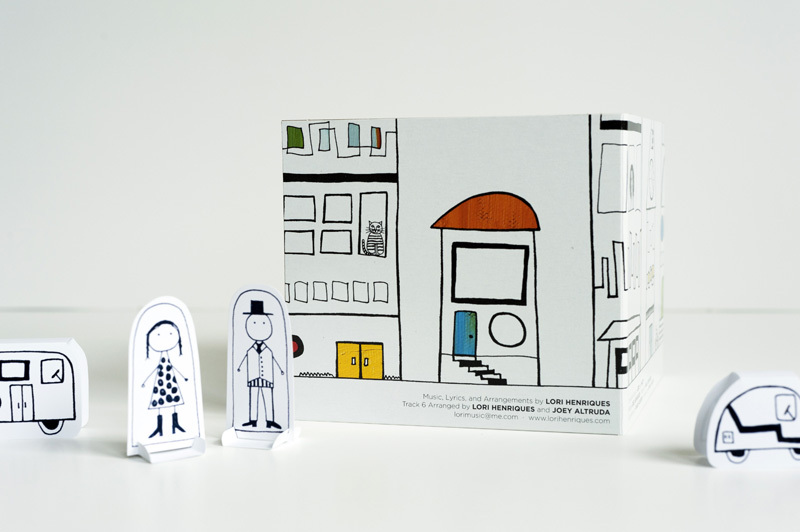 The design layout by our friend Paul Johnson turned out so fun that it works as an addition to Paper City! As for the music, of-course I think it’s brilliant, but you can also read this glowing review from Oregon Music News (They even gave me a nice review because of the artwork.) So check out Lori’s brand new site to listen for free, or buy a CD if you’d like. It’s also available for download here on iTunes. Nice one, Lori! "songs for children of all ages" - this title is completely there in the music! wow! thank you for sharing. I really like the stories in her songs. They fit my heart perfectly. 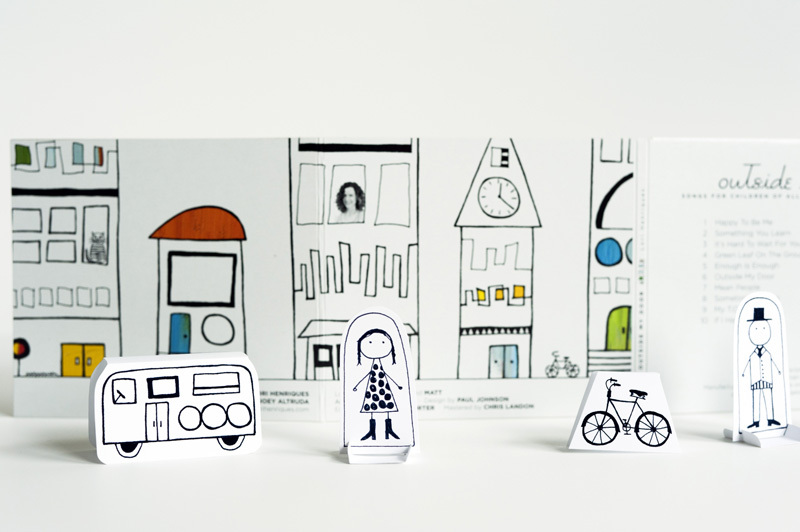 Just discovered you r blog & I love your artwork... your Paper City is awesome! oh!!!! the art work is awesome!!! and the songs too!! good team work!!! congrats!!! LOVE IT! I checked out Lori's other work on iTunes, loved the one about the birthdays. Outside My Door is coming to NM! words and music are an inspiration. Yes to spring time fun! Thanks so much everybody! I'm really excited about these songs too. Lori's lyrics are so clever. I love it! Thanks again for supporting the arts everyone! What a talented family! My son is enjoying your sister's music right now. I heard one of your sister's songs on Spare the Rock, Spoil the Child this weekend. We listen to that program every Saturday. Even though I don't know you or your sister it was great to hear and recognize her name. They played "Enough is Enough". Looking forward to buying your sister's cd. We already have the piano one and really enjoy it. Love the artwork and all the projects you share on your site. I'm hoping to try my first...the bird mobile....looks simple enough for a messy wannabe crafter.